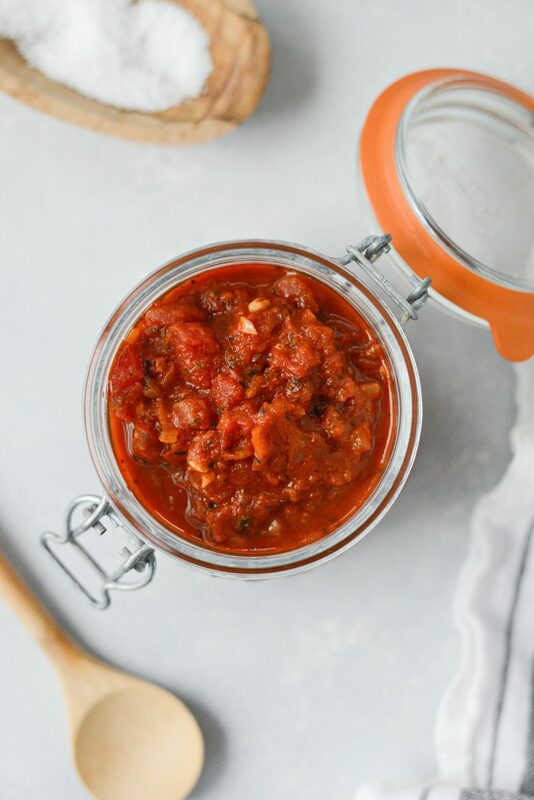 This simple Fire Roasted Tomato Pizza Sauce is a fun take on traditional pizza sauce. 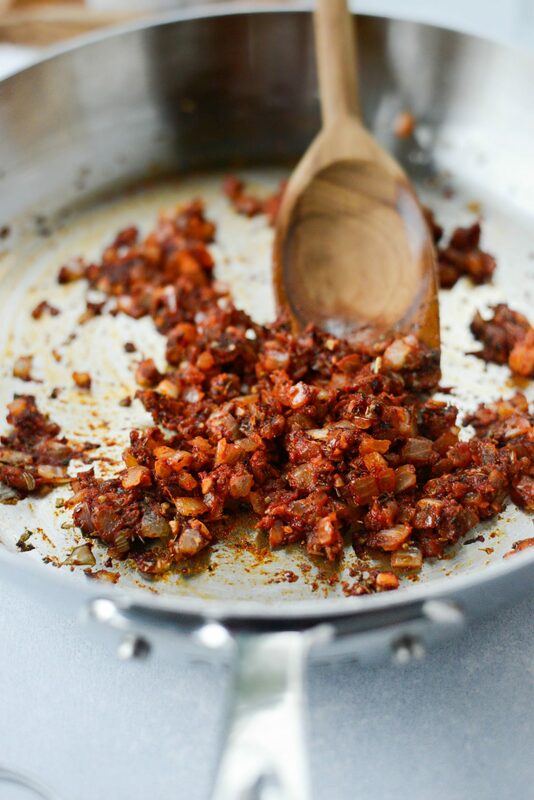 In it fire-roasted tomatoes cooked with sautéed onions, garlic, herbs and wine. 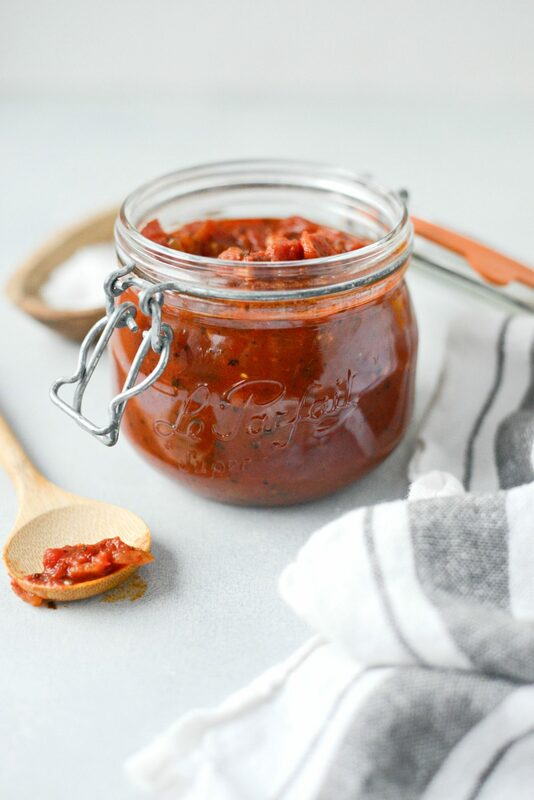 A deliciously robust sauce for your pizza or appetizer dippers. You’ll never convince me that store bought pizza sauce reigns supreme. Sure it’s okay. 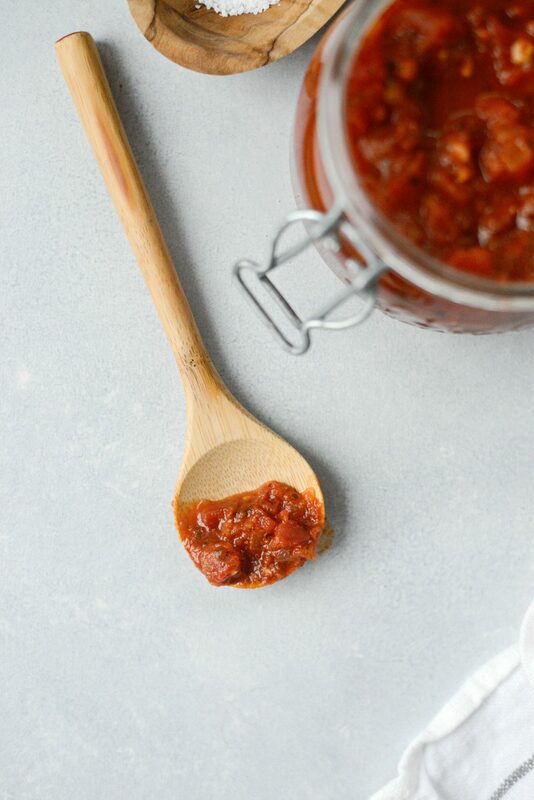 And it’s definitely helpfulperfect when in a pinch, but homemade pizza sauce will always (in my opinion) be the best. 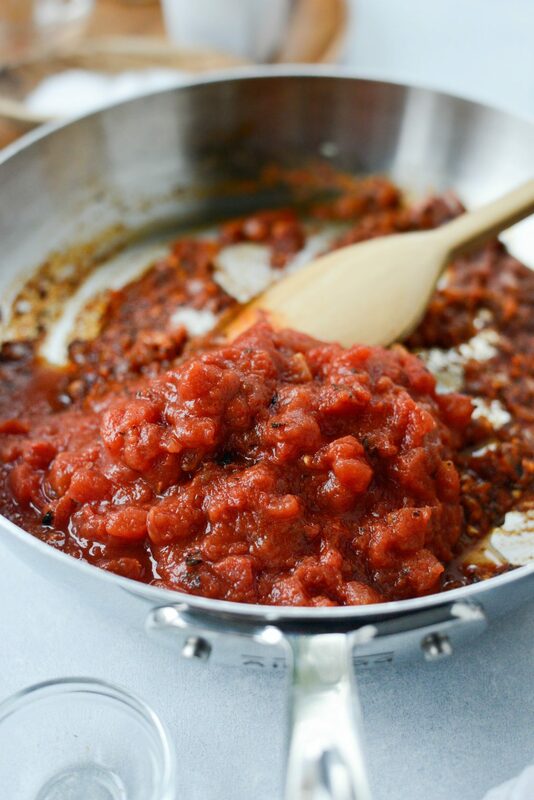 In 2013, I shared my go-to recipe for homemade pizza sauce. I use that recipe often, for calzones, stromboli, pizza (obvi). It’s such a major staple in our home that I even put the recipe in my cookbook. 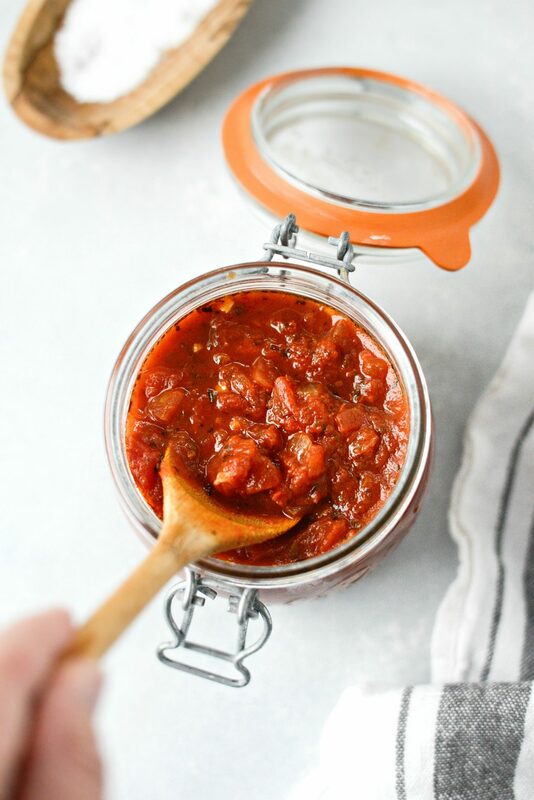 While making pizza one night, I decided to switch things up and make a fire roasted tomato sauce. Because, why not? I gathered what I have on hand; crushed fire-roasted tomatoes, garlic, wine (always have that on hand), herbs and onion. 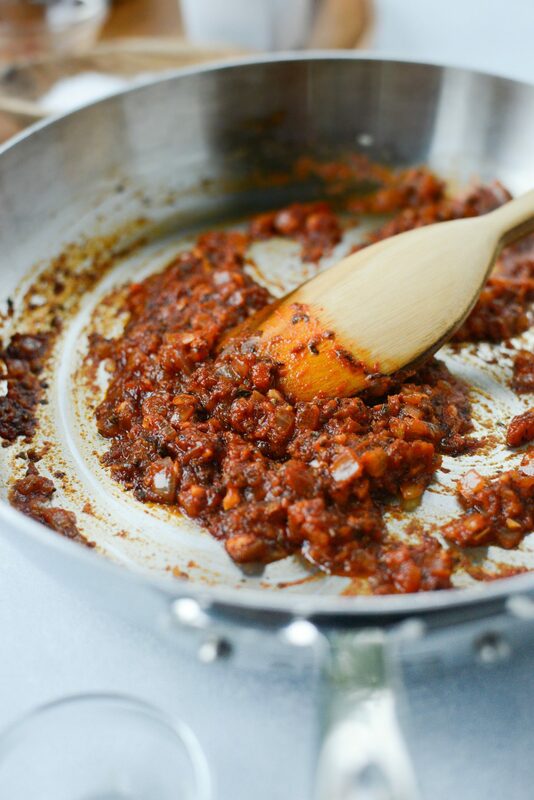 Thus resulting in a chunky-style, robust and delicious homemade pizza sauce. Part 2. 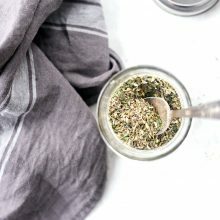 Here’s what you’ll need; 1 tablespoon light olive oil, 1/2 cup of finely diced yellow onion, 2 cloves minced fresh garlic, 2 tablespoons tomato paste, 2 teaspoons dried oregano, 1-1/2 teaspoon dried basil, 1/4 cup dry white wine, 1 (15 ounce can) crushed fire-roasted tomatoes, water and sugar. Heat 1 tablespoon olive oil in a skillet over medium-low heat. Next add in the onion with a pinch of kosher salt and then sauté until soft and translucent, this should take about 5 to 8 minutes. 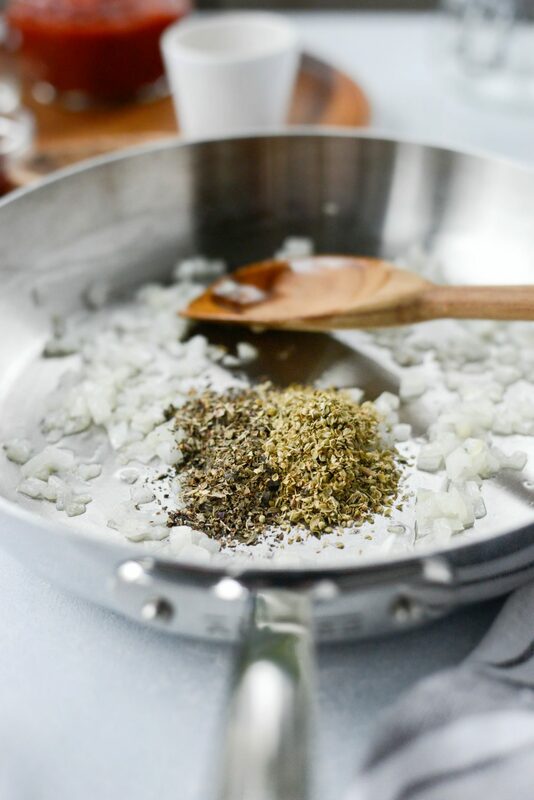 Next, add in the 2 cloves of minced garlic, 2 tablespoons tomato paste, 2 teaspoons dried oregano and 1-1/2 teaspoons dried basil. 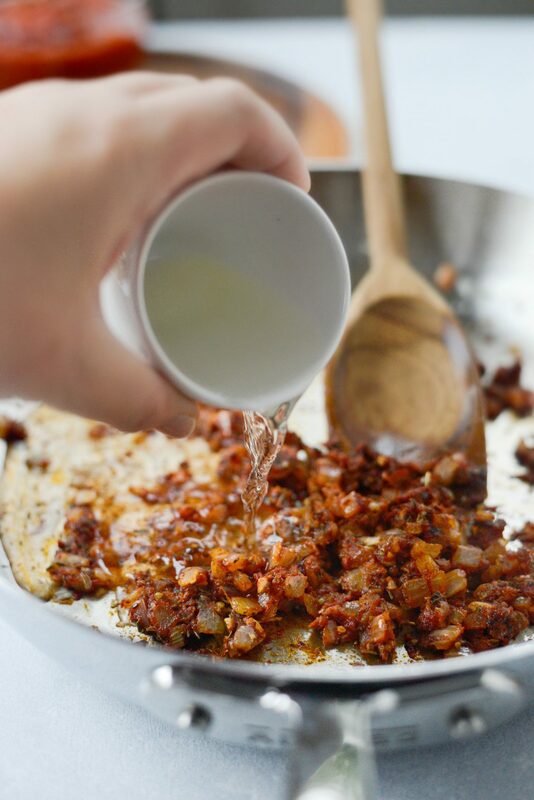 Then stir and cook until caramelized and the garlic is fragrant, about 1 to 2 minutes. Then pour in the wine and scrap the bits off of the bottom of the pan. Simmer until reduced and most of the wine is cooked out and the mixture is thick. Next add in the crushed fire-roasted tomatoes and a pinch of sugar. 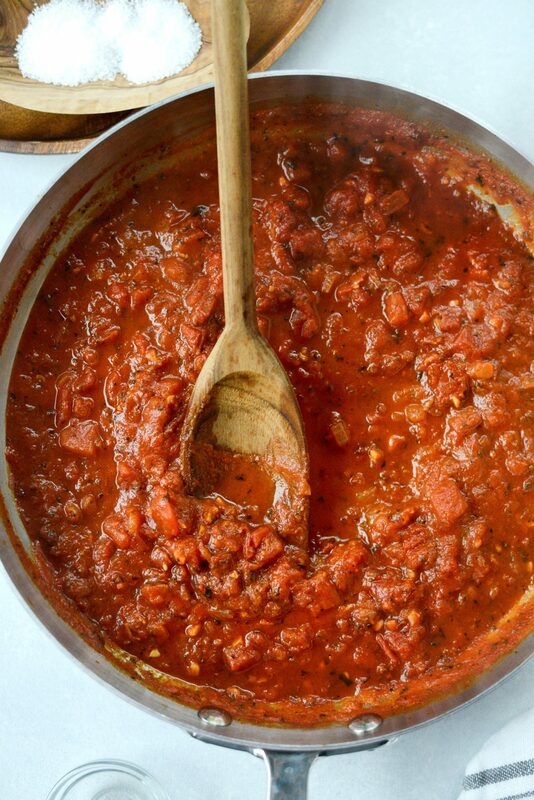 Because the tomatoes are crushed, the sauce will have pieces of tomatoes in it. As a result, you may or my not be a fan of that. 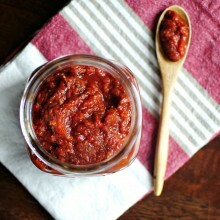 With that said, for a smoother sauce, either use fire-roasted tomato sauce or puree the crushed tomatoes. 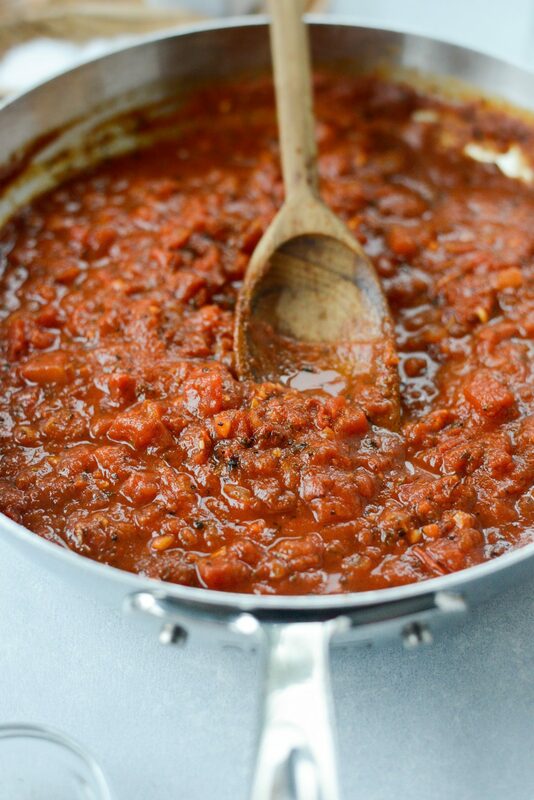 Or you can puree the pizza sauce itself. 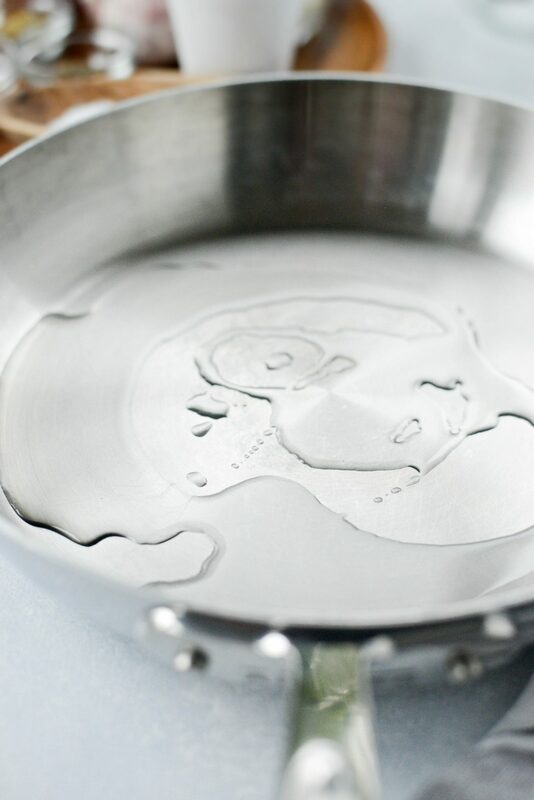 Lastly, pour in a 1/2 can (about 3/4 cup) of water. Be sure to swirl any remaining tomatoes or sauce off of the sides of the can. Bring to a bubble, reduce to low and simmer for 12 to 15 minutes. Finally you have sauce! 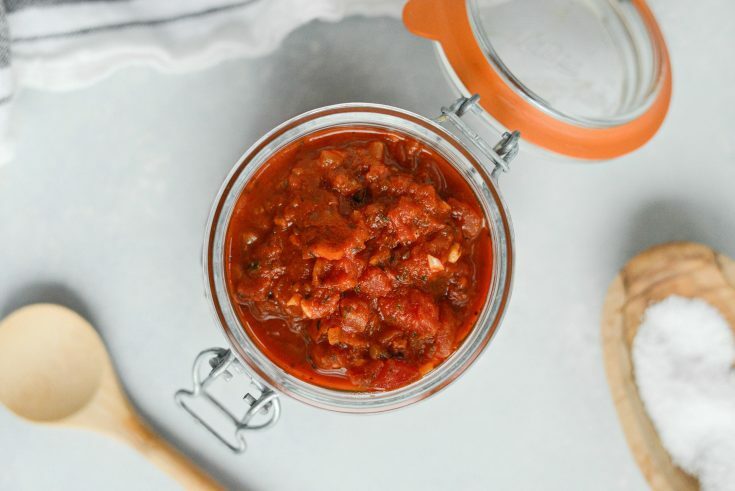 A chunky, robust, fire-roasted tomato pizza sauce. 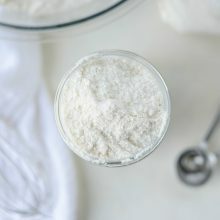 This pizza sauce recipe yields 2 cups, so you have plenty for a couple pizzas or a few calzones. It’s also perfect for dipping mozzarella cheese sticks or homemade breadsticks. Enjoy! 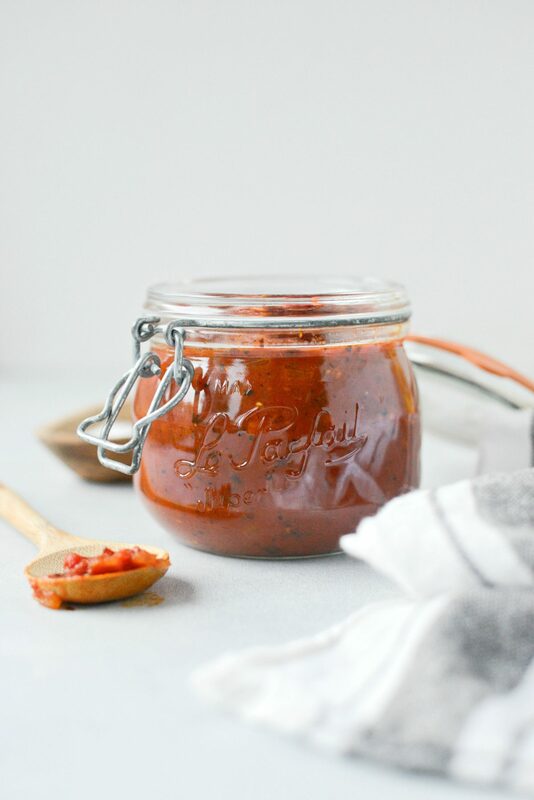 And if you give this Fire Roasted Tomato Pizza Sauce recipe a try, let me know! Snap a photo and tag me on twitter or instagram! 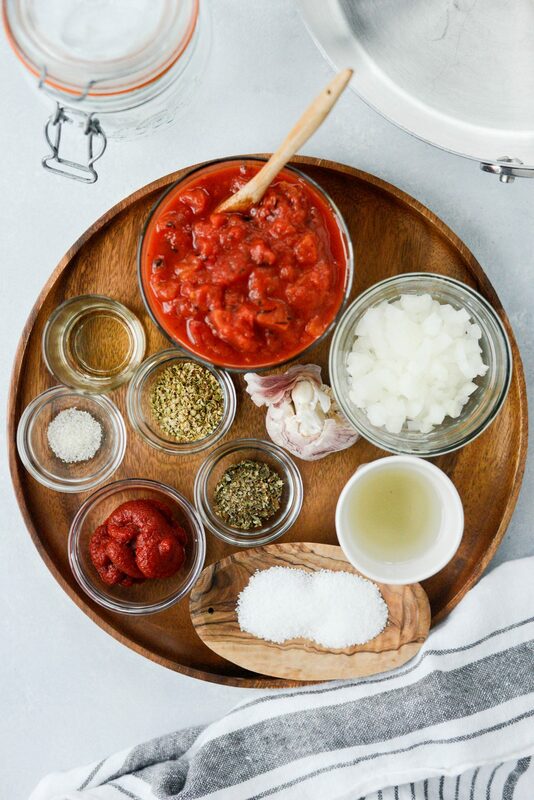 A fun take on traditional pizza sauce, this Fire Roasted Tomato Pizza sauce has fire-roasted tomatoes cooked with sautéed onions, garlic and herbs for a deliciously robust sauce for your pizza. Heat olive oil in a 10-inch skillet over medium-low heat. 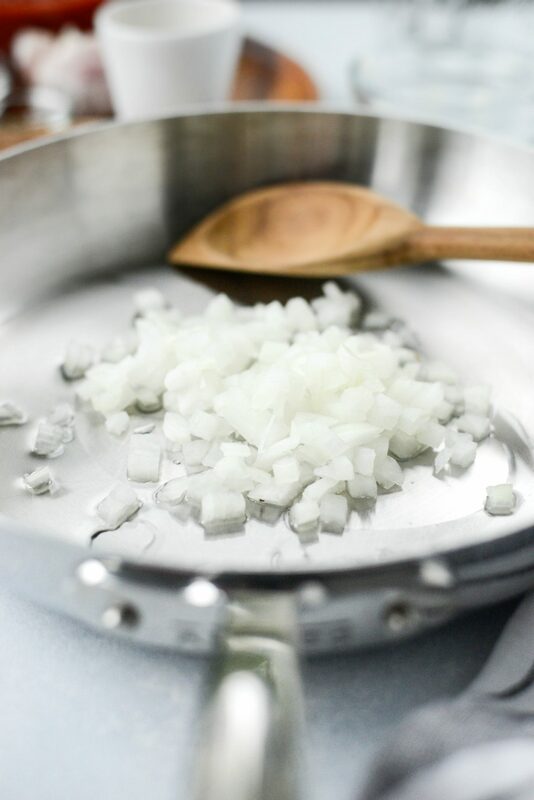 Add in diced onion, a pinch of kosher salt and sauté until soft and translucent. About 5 to 8 minutes. 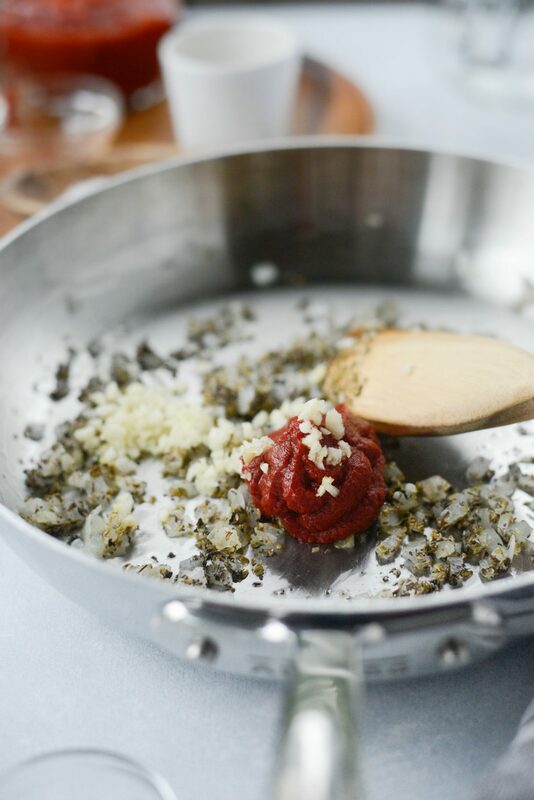 Then add in the dried oregano, basil, tomato paste and minced garlic. 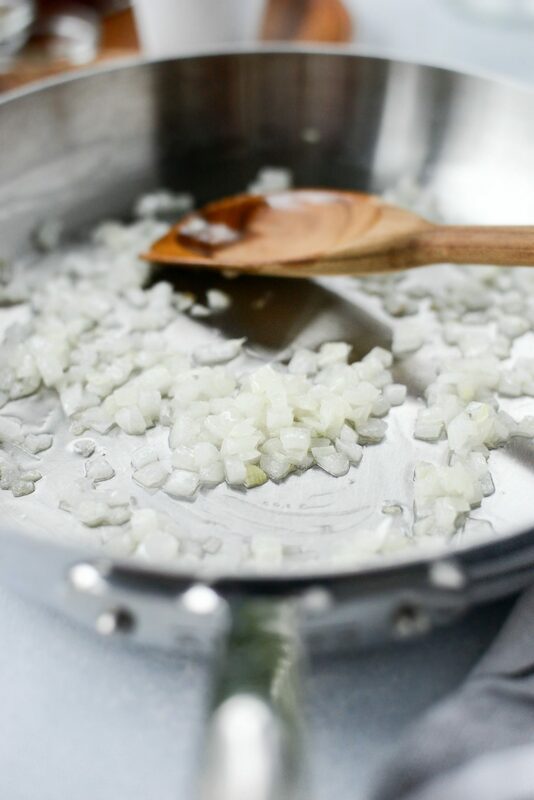 Cook for 2 minutes to caramelize and cook the garlic before pouring in the white wine. Simmer for 2 to 4 minutes until reduced. Add in the crushed tomatoes, a pinch of sugar and 1/2 a can (about 3/4 cup) water. Stir and simmer, uncovered for 12 to 15 minutes. Taste and season with 1/4 to 1/2 teaspoon kosher salt, or to taste.